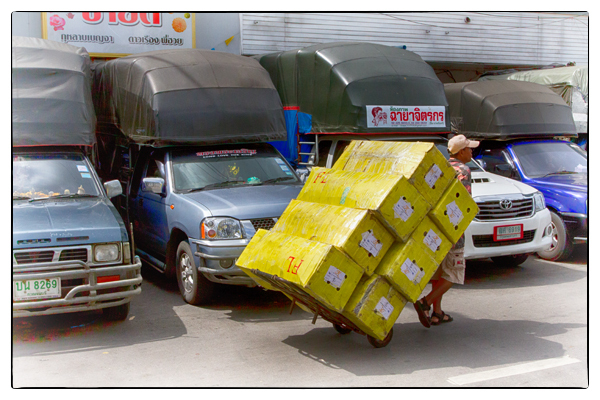 You are currently browsing articles tagged Bangkok vegetable market. 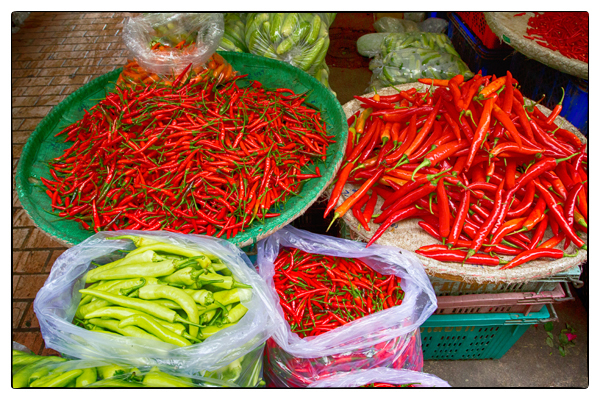 The Pak Khlong Market in Bangkok offers a wide range of Thai chiles. Photos by David Lansing. Walking through the Bangkok flower market was giving me a headache. All those perfumey smells wafting in the hot, humid air. So I walked and walked and walked until suddenly the market transitioned into long, dark corridors with giant bamboo baskets filled with cabbages and ginger root and, of course, Thai chiles. Lots and lots of different Thai chiles. From “oh-my-this-is-hot” to “HOLY-CRAP-MY-MOUTH-IS-ON-FIRE!.” Some of the chiles were so hot that just walking past them made my eyes water and the top of my head sweat. I turned a corner in the market and now I was in the fruit section: Thorny red rambutan, finger-size bananas, bumpy custard apples, mounds of unpeeled lychee and longon, and those baby Thai pineapples that, I think, are the sweetest and tastiest in the world.